Huawei had been teasing a new device launch in Chine for a week and today, at an event Huawei has announced the Huawei Honor 7i with a flip-up camera which is the first of its kind on a smartphone. of course, it is quite like the Oppo Ni which featured a rotating mechanism, but just like the Oppo N1, Huawei 7i has an advantage of using one camera for both fronts and back usage, i.e the same camera can be used for taking shots and video calling as well. And this flip-up camera on Huawei Honor 7i is the best feature, after all you can take pictures in almost any angle within 180 degrees and this is damn good for people who like to experiment with their smartphone camera.T he rear camera module is a 13MP sensor with a large f/2.0 aperture. The phone supports 4As which includes Auto Exposure, Auto White Balance, Automatic Face Recognition and Auto Smile Shutter. Huawei claims that it comes with SLR grade ISP translating into better low light performance, balance, and less noise. Huawei has also claimed that the flip-up camera is tough enough to handle rough usage and according to their statement even if you use it 13 times per day, it will last at least two years. Another highlight of the Huawei Honor 7i is the fingerprint sensor, which has been added to the side of the phone rather than usual placements on the home button or on the back panel. This makes the device more interesting. Apart from these two specialties, let’s move on to the specs. The phone has a 5.2-inch FHD LCD Negative display with a screen to body ratio of 79.8%. The Huawei Honor 7i is powered by an octa-core Snapdragon 616 chipset coupled with 3GB LPDDR3 RAM. The Snapdragon 616 chipset is much stable and low power consuming than its previous generation. Along with 3GB of RAM, there is 32GB of internal storage. 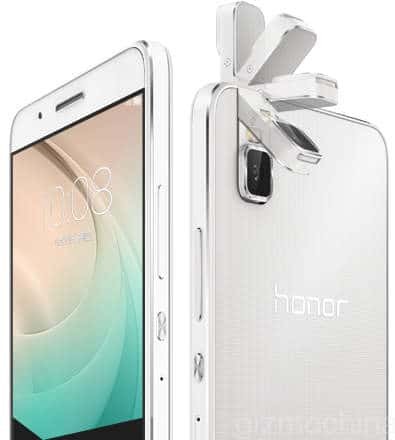 So, apart from the flip-up camera and new chipset the specs are quite similar to the Honor 7 flagship. Also, there is a 3100mAh battery under the hood to power up the device, the phone supports dual SIM dual standby and 4G LTE connectivity.